U.A.P.S.G. - G.E.F.A.I. : U.A.P. in Cerro Largo, Uruguay? 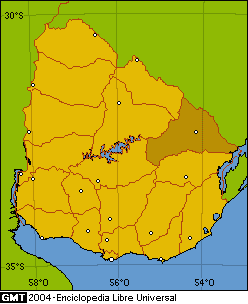 Cerro Largo is one of the 19 Departments in which is politically divided Uruguay (see map). A professor together with students were working on a ranch, and he took pictures of the field and the people. When he came home and looked at the pictures he took, he discovered to his surprise, an object for which initially he has no explanation. As a matter of fact, looking at the photos he also speaks about two objects. The video belongs to the local TV Channel 12. Regretfully, as we have pointed out many times, before someone puts a video in YouTube, the experts should be called, and only if there is no conventional explanation for what was photographed, then it could go through YouTube. The members of UAPSG in Uruguay are taking care of this case. Hopefully we will bring you news as soon as we have.